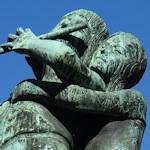 Mozart’s Tamino and Pamina achieve bronzed immortality in a fountain on Vienna’s Mozartplatz. This watery nod to the maestro’s operatic endeavours is another example of Secessionist art from the early 20th century. The Mozart-Brunnen (Mozart fountain) sits at the centre of Mozartplatz (Mozart Square), itself found in the middle of Mozartgasse (Mozart Street). So it will come as no shock to learn that there’s a Mozart theme at work here. The square and street both got their musical name in 1862, but the fountain didn’t appear until 1905. It’s also known as the Zauberflötebrunnen or “Magic Flute fountain” since it depicts the “Trial by Water” scene from the opera of the same name. The two bronze figures are the lovers, Tamino and Pamina, who draw on the protective power of the magic flute to survive the ordeal. It’s not the only evidence of Vienna’s love for this particular opera: see, for example, the Papagenotor. Carl Wollek sculpted the figures and Otto Schönthal designed the fountain, which honours the 1791 premiere of the opera in Vienna. Mozart conducted the orchestra himself that day, though the venue (the “Theater auf der Wieden”) no longer exists. Given its date of construction, the fountain falls into one of the more creative periods of Viennese art, when Jugendstil (Art Nouveau) was all the rage. Schönthal, for example, was a student and then colleague of one of the fathers of modern architecture, Otto Wagner. Wollek built several other fountains during his working life, including another Mozart one in St Gilgen, near Salzburg. Despite its artistic heritage, the fountain is a little away from the usual tourist haunts, so really only something worth seeing if you’re a fan of Mozart or Fin de Siecle design. Mozartgasse joins two of Vienna’s largest streets – Favoritenstraße and Wiedner Hauptstraße – and is easily reached. Subway: The closest station is Taubstummengasse on the U1 line, which is about a 3-minute walk away. Tram: The lines 1 and 62 both stop at Paulanergasse, which is also 2-3 minutes from Mozartplatz.